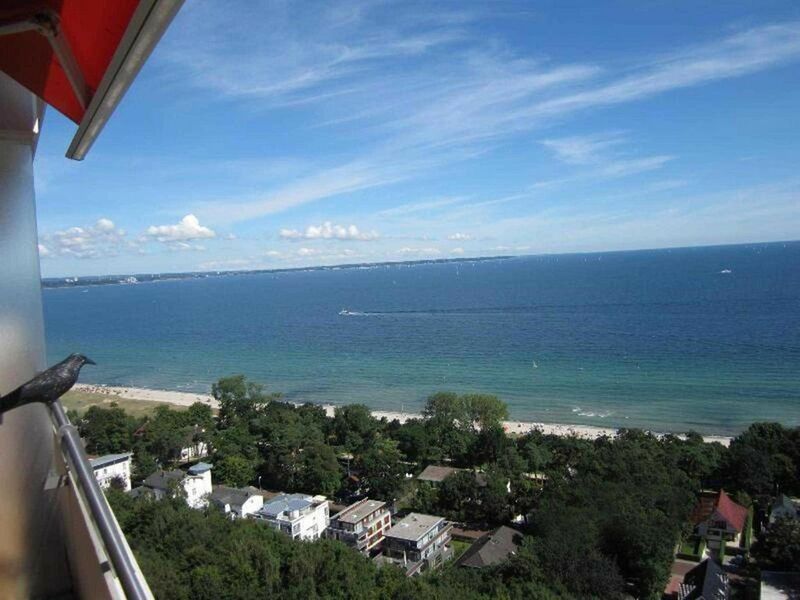 1-room apartment (about 35 sqm) with bath / shower / WC, balcony with free view of the Baltic Sea. Underground parking, indoor pool and sauna use directly in the house free of charge. Hotel comfort, restaurant, hotel bar and the sports and fitness facilities can be used. Access easily via the elevator. Panoramic view of Bay of Lübeck! Lakeside balcony. By the sea, on the beach. The price includes: season ticket for swimming pool (indoor pool, outdoor pool) and brand new sauna spa and underground parking space! Hotel Comfort: spa, golf, etc. The private apartment (35 sqm) with balcony (1 room apartment) is located in the 18th Floor (no. 195) Maritim Residence Club Hotel Timmendorfer beach, at the Forest Chapel 26, located towards the lake with absolutely free 100% panoramic views of the Baltic Sea. Through the floor to ceiling windows, the apartment looks bright and full of light. Relax with a breakfast at Meeresrauschen on the lakeside balcony. The well-maintained living / sleeping room furnished for 2 persons has a double wardrobe bed with two separate mattresses, couch, integrated, high-quality kitchen with 4 ceramic hobs, microwave, dishwasher, refrigerator with freezer, coffee machine, egg and water cooker, toaster, crockery, Cutlery, ironing board, iron, vacuum cleaner, new flat screen TV (HD), radio; Bath / shower / WC (renovated in March 2019), hair dryer. Non smoking apartment! Pets not allowed! Suitable for allergy sufferers. Sun blind, sun awning on the balcony. There is a free parking space in the underground car park. You also have the opportunity to use the entire swimming pool area of ​​the hotel in addition to the brand new sauna spa with our two swimming pool tickets free of charge (7-22 clock). In the same building, accessible by lift, is the Maritim Clubhotel, where you can enjoy a variety of leisure activities: outdoor pool (heated v. May to September), large indoor pool (each 25 x 12 m) with brand new sauna spa (free with swimming pool cards), solarium, tennis courts (1 indoor and 2 outdoor courts), 4 bowling alleys and 2 bowling alleys, gym, multi-purpose court for basketball, football and handball, table tennis (indoor and outdoor), archery, beach volleyball at the outdoor pool, beauty salon, massage, bowling / bowling, pool table, table football, bars and restaurant (evening entertainment, dance, disco). It is possible to take advantage of the hotel's breakfast and dinner buffets for a fee. Z. Zt. Lunch menu at 9.90 € incl. 1 alcohol. Drink. The golf course about 2.5 km. Quiet location on a hill, but only a few minutes walk to the beach and center, with a wonderful view of the Baltic Sea. By the sea, on the beach.